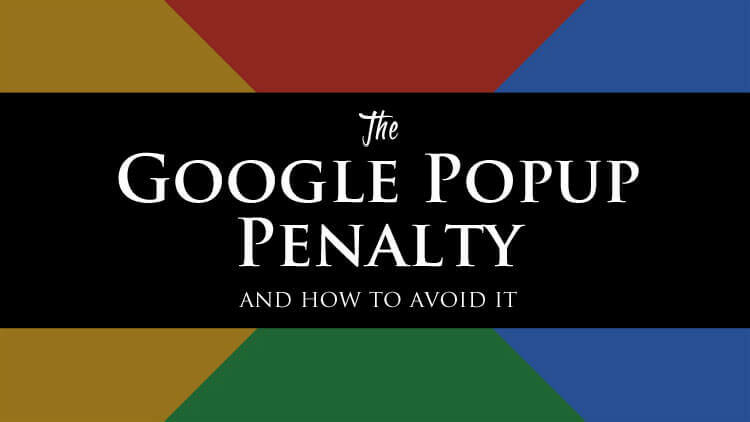 Home » Internet Marketing » Blogging » The New Google Popup Penalty – Don’t Get Penalized for Mobile Popups! 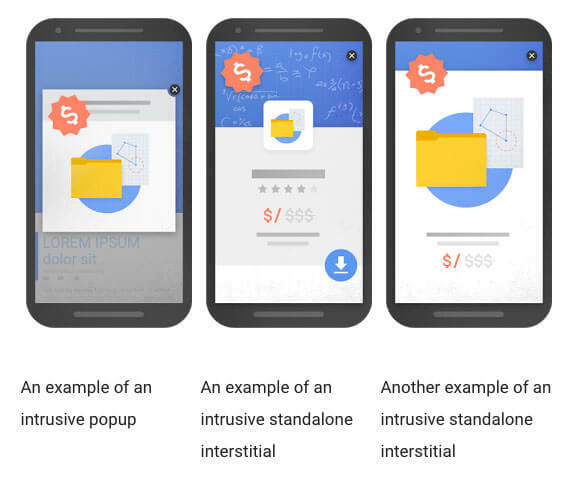 Late last year, Google made an announcement that they were going to start penalizing websites (in terms of ranking) that use ‘intrusive interstitials’ on their mobile pages. We'll call this the Google Popup Penalty. Google’s purpose here is to make the mobile web a more friendly place to be, considering, according to Marketing Land, mobile devices are now driving 56% of traffic to top sites. What Google is trying to prevent are intrusive popups that hide the content that the user is trying to find. While the underlying content is present on the page, it’s visibly hidden by a popup that needs to be actively closed before the user can get to the content they are looking for. This is super frustrating! I’m sure that all of you reading this have been to a site where you are trying to read there content only to be blocked by an annoying popup – that’s typically pretty damn hard to close on mobile. Note: If you are new to blogging you may want to check out our Definitive Guide to Blogging post that dives deeper in to what it takes to build a successful blog that your readers will enjoy coming back to! So, in order to improve the mobile search experience, they announced that on January 10th, 2017, pages where content is not easily accessible to ta user coming from the search engine may not rank as highly anymore. If you think about it – this definitely makes sense, as Google’s main objective is to make the internet more accessible, usable, intuitive and honest – ESPECIALLY now for mobile browsers. How many of you have popups running on your site that pop up as soon as the user enters your page? Clearly, the user is interested in reading your content, and then all of a sudden you block that content with a popup that says “BUY THIS” or “JOIN THIS.” Put yourself in the shoes of that user – are you still excited to read that content? What would you do? Would you just hit the back button? As a little analogy here – think of your blog as your home. Let’s say you have a stranger you are really interested in showing your home to – you make the house all nice and pretty, clean the heck out of it, decorate it the way you think they would like it, and so on. The day comes – they are here! They walk through the front door – take 2 steps in and BAM! You smack them in the face, throw a pencil and paper at them and scream SIGN MY GUESTBOOK! You tell me… good experience? Or bad? This currently only affects MOBILE search, not desktop. Many of the premium and free popup plugins out there for WordPress offer the ability to turn off your popups on mobile devices. This currently only matters on the transition from search results to the page that is loaded. What? That means that you could technically just set up your popup to show on the second or third page that the user (hopefully) goes to view. Again, many (if not all) plugins offer that functionality as well. This only matters on blog posts and pages that you are actively trying to rank. If you have posts that you don’t care if they rank or not (you should), if you aren’t doing any keyword research at all or optimizing your post (you should), or if all you are relying on is social media promotion – then maybe this warning isn’t for you – OR maybe you should change the way you are looking at your blog. So, What Can You Do to Avoid the Google Popup Penalty? Actually – if you’ve been using popups, or want to start – you have a TON of options. 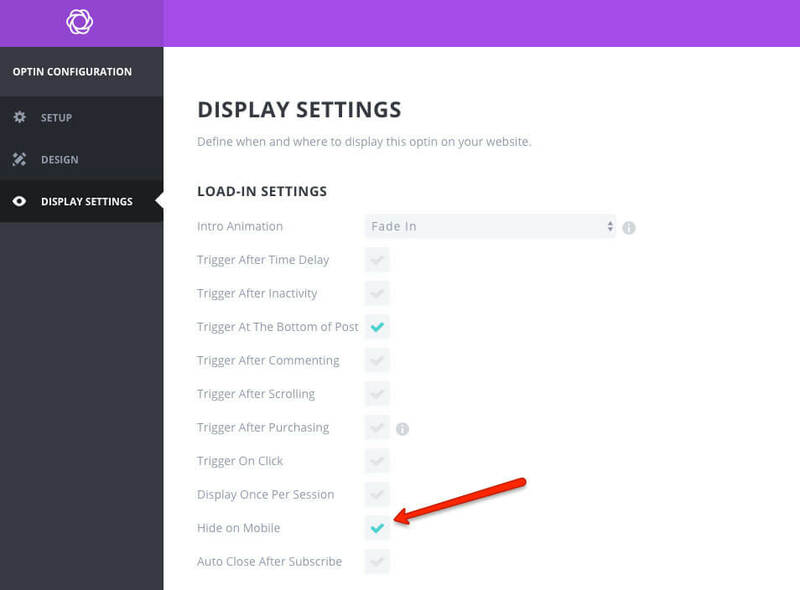 Like I said above, many of the best popup form plugins out there (like OptinMonster, SumoMe, and Bloom) all offer settings that will allow you to turn of your popup on mobile devices. Also, many of them offer more than just popups, like inline forms, or even floating bars. Floating bars are a great way to get your popup in to a mobile page without it being terribly intrusive, and if your popup plugin doesn’t have that feature, you can look in to options like QuickieBar Pro or Hello Bar (there are a ton of these out there). Lets take a look at what you can use. I’m going to cover some possible options using some popular plugins – OptinMonster, SumoMe and Bloom – also a floating bar specific option called QuickieBar Pro. Make sure your popup is set to only show up on desktop. All of the plugins mentioned above, and pretty much all others, offer the ability to turn off your popups on mobile devices. In fact, if you are an OptinMonster user, you would have had to create a MOBILE SPECIFIC popup separately, as by default, lightbox popups don’t even show up on mobile. With Bloom, under their display settings for popup specific forms, you simply have a “Hide on Mobile” option – if you just check that on, you are good to go. With SumoMe, even with their free version (not nearly as powerful as even their cheapest paid account – but still usable) you can create display rules that will hide the popup on mobile devices. On the more advanced plugins (OptinMonster, SumoMe) you can actually decide to hide your popups based on the referrer of the user. In this case you would choose to ‘hide’ the popup if the referrer link (where they came from) contained ‘google.com’ – meaning they came from the search engines. This means that your popups would still show up if your user came from, say, promotions on Facebook or Twitter. NOTE: Keep in mind, that the reason Google is doing this is to give the mobile user a better overall browsing experience, so this goes back to my statement before… BE COOL! Just because you can show popups – doesn’t mean you always should. You want your users to ENJOY coming to your site, so that they come back again and again! Use Floating Bars or Inline Forms Instead of Popups on Mobile! You don’t always have to utilize popups. While they are great, we’ve seen that they can get annoying, can cause terrible bounce rates, and can generally just frustrate the heck out of your users. Think about utilizing Floating Bars or Inline Forms on your mobile pages. All available optin form plugins SHOULD allow you to add optin forms easily within your posts/pages, after your posts, in sidebars with widgets, using shortcodes… you have a lot of options that don’t involve using popups. If you aren’t using one of those premium plugins, at least if you are using MLSP Sites (MLSP’s blogging platform) you can utilize QuickieBar Pro – which is a super simple plugin to allow you to create optin forms or ‘calls to action’ using floating bars. Once you have one created, you can easily set it to specifically display on either desktop, mobile, or all devices. It’s clear that mobile traffic is showing no signs whatsoever of slowing down. This means that you want to take great care of your mobile visitors. I always say – put yourself in your users' shoes. If a stranger comes in to your blog for the first time, especially via a mobile device, how are you treating them? Are you asking them to sign up for a mailing list before they can even see your content? Or learn who you are? What do you think the odds are of them saying – yeah, I’ll give my email to this complete stranger! Is your site just littered with calls to action to a random assortment of affiliate links, free downloads and more in hopes that ONE of them will interest your user? How do you think that looks? So – in closing, especially if you are using popups right now that show up on mobile devices, it’s time to take a good hard look at how you are treating your users. Not only in Googles' eyes (which we’ve seen that they are getting pretty picky, and rightfully so) but also in your users' eyes. Personally, I think that this is a great move by Google. There are so many other creative ways to market than just slamming users with annoying popups! How timely was this post!? EXTREMELY! I was just talking with some tribe members about the benefits of being professional, not spammy, on their sites by NOT bombarding their audience with popups & “offers” every inch of their sites! Now I have this amazing article to forward to them! Thanks, Jim! 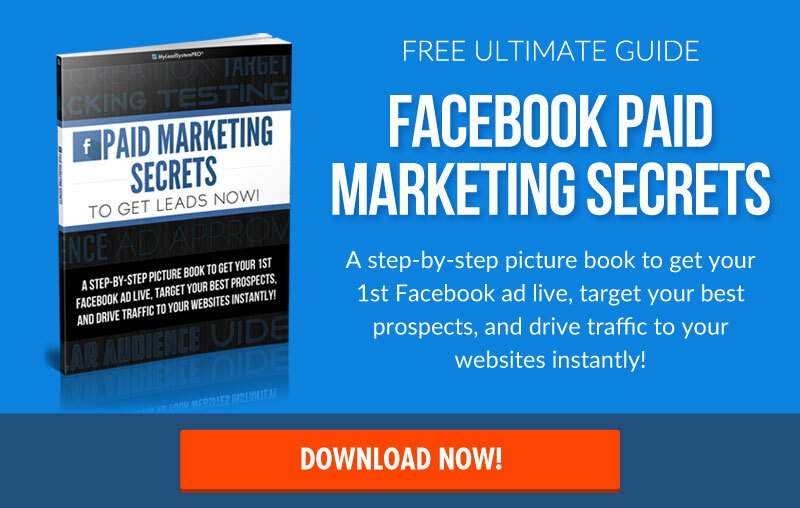 Get the 21 Page PDF Now!